The Daily Mail newspaper has been publishing stories about Near Death Experiences taken from a new book The Wisdom Of Near Death Experiences by Dr Penny Sartori. This led to some of their readers sending in associated stories about their own experiences - though not necessarily about true NDEs. Here's one example of the stories published, which is more to do with precognition or contact with a deceased loved one. 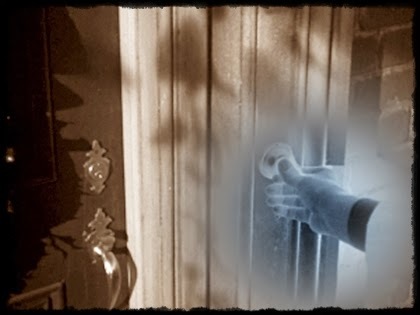 "It was one o'clock in the morning in May 1982 when the ring of the doorbell woke us up. My husband John went downstairs to answer the door then returned to the bedroom looking miffed, saying nobody was there. For some unknown reason I had a strong sense it was my 25-year-old younger brother Steve. He was in the SAS and based nearby. A few seconds later it rang again and John traipsed back down the stairs. Again, there was nobody there. It buzzed a few more times after that, but we decided to ignore it. At 10am the next morning my father phoned with devastating news. Some officers had arrived to inform him that Steve had been killed in a helicopter crash in the Falklands. At that stage we knew very few details of how he had died but that night my oldest son, Robin, who was then eight, had a dream that his Uncle Steve had risen up out of the water with his arms up and said: 'Don’t worry about me. I'm OK now.' Incredibly, I too had experienced the exact same dream. We later learnt that the helicopter had crashed into the South Atlantic Ocean and Steve had drowned." You can read more of the Daily Mail stories here. 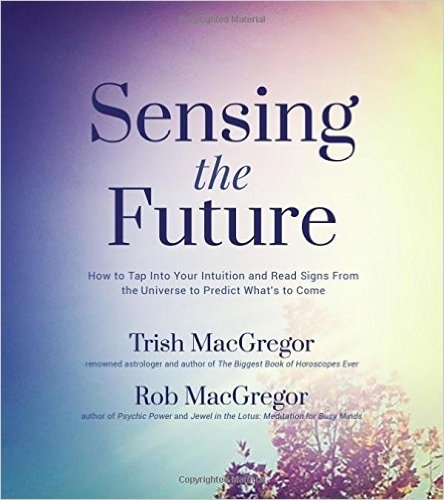 I wrote this post a couple of weeks back after I had just finished reading Trish and Rob's book The Synchronicity Highway. "Joseph McMoneagle was involved in remote viewing experiments conducted by U.S Army Intelligence and the Stanford Research Institute. He was one of the original officers recruited for the top-secret program now known as the Stargate Project. Along with Ingo Swann, McMoneagle is best known for claims surrounding the investigation of remote viewing and the use of paranormal abilities for military intelligence gathering." "When I was first started viewing these targets, I kept getting the same thing over and over again. It looked like the old hippie peace sign a large 'Y' inside a circle. Only the circle was missing. So it looked like and equilateral 'Y' with angles all the same." This seemed to have puzzled him but then he had what he describes as an, "... epiphany ... 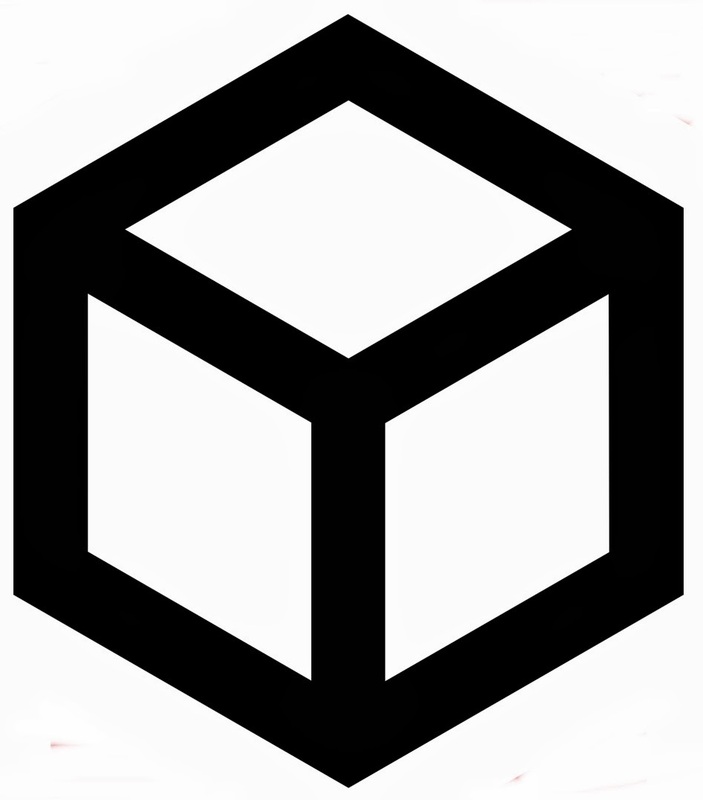 The 'Y' is the inside or outside of an empty box." And this is from where my coincidence or synchronicity happened. I realised I had to go out, so put the book to one side but was pondering the 'Y' and the 'box' while I went out of my front door. And there parked outside my house was a DPD van with the outline of a 'box' and therefore the 'Y' as well as the company logo. The parcel wasn't for us but for a neighbour but it made me smile that I was looking at the very thing I was thinking about. But that is the world of synchronicity for you. As McMoneagle continued to say in his interview with Trish and Rob, "Once in a while I've been able to peek behind those boxes, and to see things I'm sure they do not expect me to see." And again isn't that the world of synchronicity? Sometimes it allows us to see things we maybe wouldn't otherwise notice or pay attention to. And this perhaps gets us thinking outside the box. The Jewellery Name That By Coincidence Is Where Her Ancestors Originated. Sometimes I'm surprised from where ideas for posts originate - occasionally they pop up purely by 'chance'. Maybe it's because my 'radar' is adjusted to such things, I would never have otherwise noticed. Here's a short coincidence example I saw while looking at a jewellery website Abrau Jewelry - a difference there between the British and US spelling. Anyway, mustn't get sidetracked, here's what I read on the aforementioned website by the owner, Danielle Nicole King, about how she decided on the name for her business. "The name 'Abrau' is a name that my oldest son, Nico, started calling me. After a week of being called Abrau, I finally asked him where he came up with that name. He told me that it just popped in his head and he couldn't stop thinking about it. 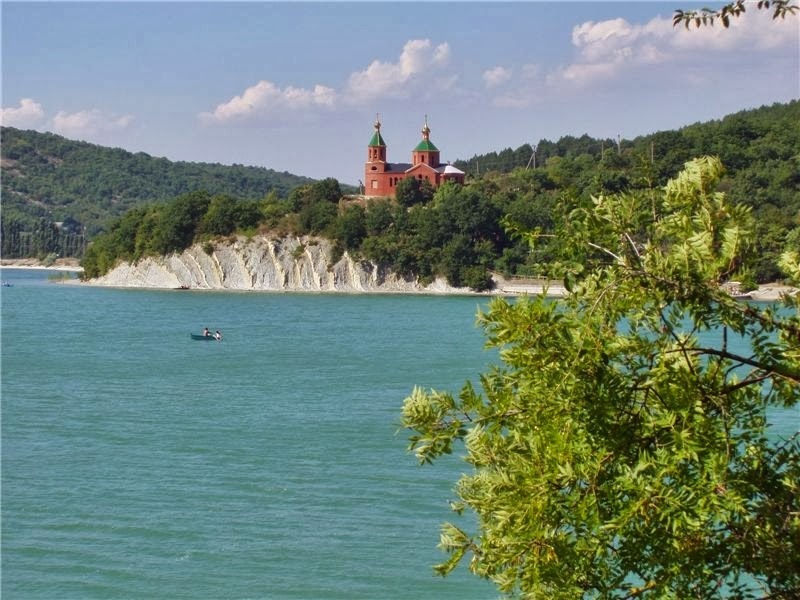 I looked online to see if it meant anything and I was amazed to discover that Lake Abrau is a Lake in Russia, where my Ancestors are from! It just seemed like I was destined to find that name and he still calls me Abrau to this day. By naming my jewelry Abrau, I am honoring my oldest son, my family and my heritage." It makes you wonder why Nico started to use this particular name. Was it perhaps deep in his subconscious from another time? From what I've read, Danielle Nicole King seems to be travelling a spiritual path so there is a likelihood her son is too. She writes on her website how she is, "greatly inspired by Buddhist philosophies and the yoga spirit which, if followed, can bring a person a greater sense of peace, freedom and tranquility." As for Lake Abrau, according to Wikipedia the name is from the word 'Abkhaz' meaning sinkhole. It lies 84 metres above sea level, among the foothills of the Forecaucasus, about 14 kilometres from the Black Sea port of Novorossiysk, Russia. The lake is approximately 2,600 metres long and 600 metres wide. The photo at the top of the post shows Lake Abrau and is in the public domain. Lord Westmorland, it is reported, was dining one day with Mr Child when he asked him to suppose himself in love with a girl, and her father refusing his consent of the union. "Well what would you do?" queried the Lord. "Why, run away with her, of course," promptly replied Mr Child. The same night Lord Westmorland ran away with Mr Child's daughter. 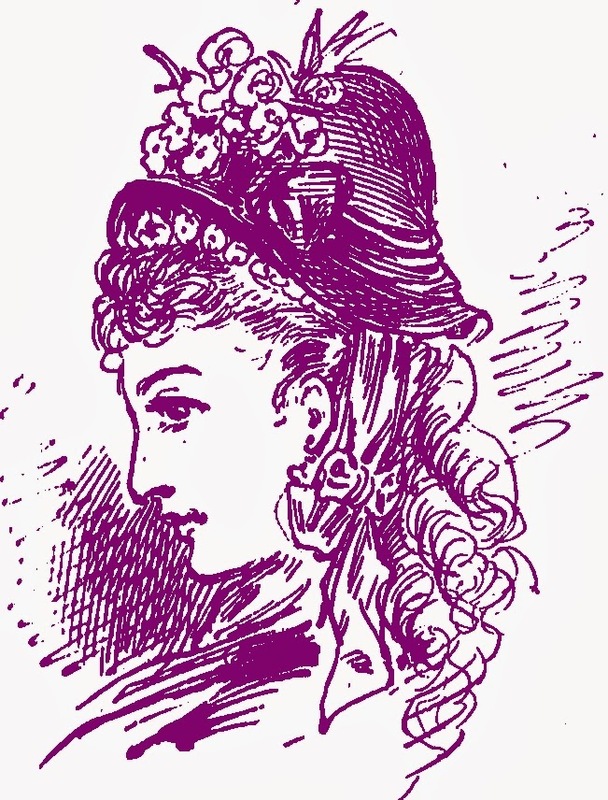 Mr Child pursued the couple and came up with them in Northumberland, when the gallant Lord, in order to get ahead, stood up in his carriage and shot the leading horse in Mr Child's chaise. "Which," according to Mr Hilton Price, "caused the whole vehicle to capsize." Lord Westmorland then got across the border, the blacksmith was in readiness, and the pair were married at Gretna Green before Mr Child could interfere with the ceremony. Gretna Green's famous 'runaway marriages' began back in 1754 when Lord Hardwicke's Marriage Act came into force in England. Under the Act, if a parent of a minor (anyone under 21) objected, they could prevent the marriage going ahead. The Act tightened up the requirements for marrying in England and Wales but did not apply in Scotland. So young English couples eloped to Scotland. In the 1770s Gretna Green became the first easily reachable village for the English to get married, The Old Blacksmith's Shop, built around 1712, and Gretna Hall Blacksmith's Shop (1710) became the focal points for marriage. 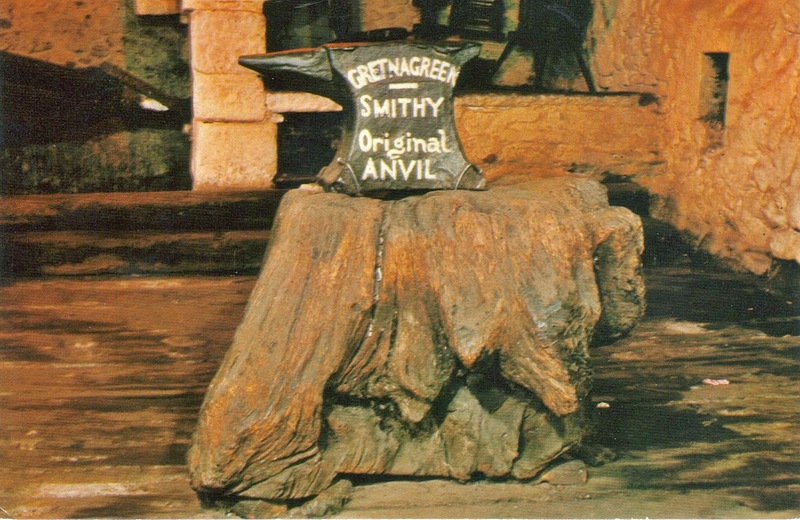 The local blacksmith and his anvil have become the symbols of Gretna Green weddings. Scottish law allowed for 'irregular marriages', meaning that if a declaration was made before two witnesses, almost anybody had the authority to conduct the marriage ceremony. The blacksmiths in Gretna became known as 'anvil priests'. Since 1929, both parties in Scotland have to be at least 16 years old, but they still may marry without parental consent. In England and Wales, the age for marriage is now 16 with parental consent and 18 without. It's always fascinating when answers to a question come about all by themselves. Last night Karin was watching a soap on television she quite likes. As it started she noticed the letter 'P' at the bottom of the screen. She asked me what it meant. I'd noticed this myself several times prior to the start of programmes, but had never made any effort to find out what it signified. "Must find out," I muttered and immediately forgot all about it. Today I bought a newspaper and, when I got home, opened it up at random to page 60 and found the answer to the question! 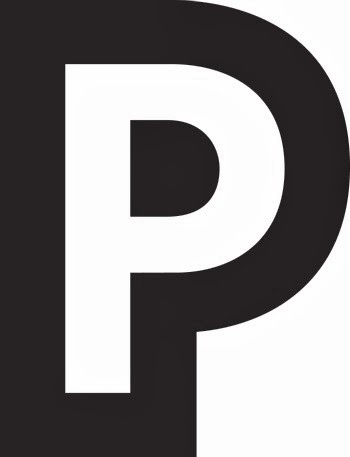 It seems that the 'P' has been around (in the UK) since 2011, though surveys have shown that very few people know what it means: Product Placement. 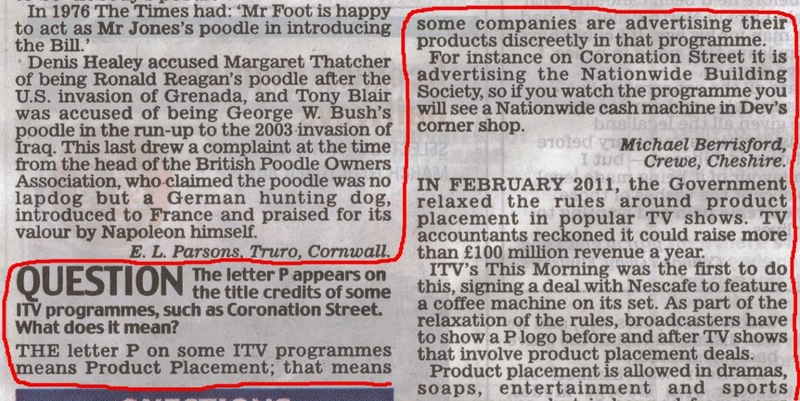 "Product Placement ... that means some companies are advertising their products discreetly in that programme. 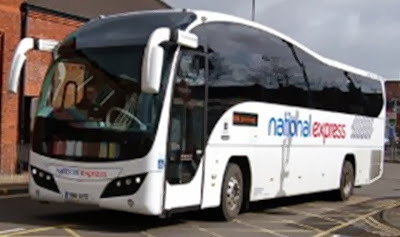 For instance in Coronation Street it is advertising the National Building Society, so if you watch the programme you will see a National cash machine in Dev's corner shop." So, as well as having obvious commercial breaks full of ads, there are now hidden persuaders within the actual programmes themselves. There are rules about product placement - see the Ofcom website - but, whatever is said, it's surely a form of subliminal advertising, which was once banned. These hidden persuaders are difficult to avoid wherever we look. Did we really want to buy or drink that can of Coke or consider a National Building Society account? How many of our thoughts are really our own? 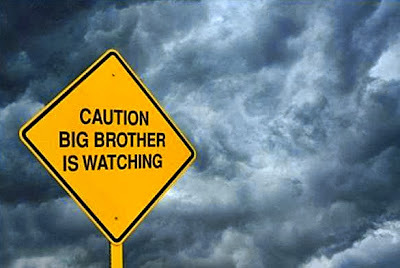 Or maybe Big Brother is at work? It was our granddaughter's first birthday last week so we headed for the local Card Factory shop and bought her a card - though it looked a lot better than my photo! So it's a first birthday card, but is unsuitable for her until she's three years old! It's a mad world at times. I have published many posts on this blog about white feathers. Mostly people finding the feathers have linked them with loved ones who have died. It's as if they are messages from the dead. I have experienced this myself but the following, from Nama Freesa, is a variation on the theme. This time the feathers (and also roses) are being seen as a symbol or message that prayers are being answered. See what you think. "I experienced feathers all about me whenever I would pray. I prayed for my wayward son at one point in my life, for God to help lead him on a righteous path. When my father passed away I had the company of the priest, who had officiated at my father's funeral services. At my table during the luncheon after the funeral service he asked me my name and I told him, Theresa. He told me his mother's name was Theresa and was named after St Theresa the Little Flower. I told him that was who I was named after as well. He told me a story about his mother during the Vietnam War era and when his brother served during that time. His mother would pray for the safekeeping of her son, and she always knew her prayers were being answered by coming across a rose. I told him about finding feathers whenever I prayed for help or guidance, and he told me that the feather was the sign of the Holy Spirit. So, not only are your prayers being answered, but they are being answered by the highest of all powers. That brought me such great comfort." I'd never heard previously of roses being a symbol of prayers being answered, though I do remember hearing something of St Theresa of the Roses as mentioned above. "As she was dying in the convent infirmary, Therese could look out and see the rose bushes blossoming. She loved roses. She had thrown rose petals as a Child before the Blessed Sacrament. As she reflected on her quiet, hidden, and gentle life ending, she believed in faith that God had great things in store for her. She believed that her mission was only beginning as she entered the fullness of life with God. She explained: "After my death, I will let fall a shower of roses. I will spend my heaven doing good upon earth. I will raise up a mighty host of little saints. My mission is to make God loved..."
Shortly after her death, the rain of roses began. Sometimes roses literally appeared, and sometimes just the fragrance of them. Cures of painful and fatal diseases and many other miraculous experiences were attributed to her intercession. Sometimes people found inner peace and regained an inner warmth of spirit and confidence, by appealing to St. Therese." 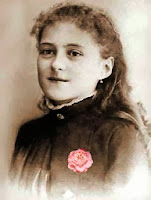 On Wikipedia I found that: "St Theresa, Saint Thérèse of Lisieux (January 2, 1873 - September 30, 1897), or Saint Thérèse of the Child Jesus and the Holy Face, O.C.D., was a French Discalced Carmelite nun. She is popularly known as The Little Flower of Jesus or simply, The Little Flower." So white feathers and roses may be signs that prayers are being answered. It would be interesting if anyone else has found this to be the case. Gurdjieff was of the opinion that we should try to remember oneself. He believed that during most of our lives it is the machine or the robot who sees and experiences whatever is there. Colin Wilson told of "... how in all moments of deep happiness, we get the feeling that could be expressed: 'What, me - here?' I am not only aware of what is happening to me, but that it is happening to me." Gurdjieff though, realised we aren't always in deep happiness mode, and asked, "Why should we experience so much, only to forget it immediately afterwards? Half our experience rolls off us like water off a duck's back. Yet experience is food, whose purpose is to enable is to evolve." "Thus, for instance, at that time I used to like to wander through St Petersburg at night, and to sense the houses and the streets. St Petersburg is full of strange sensations. Houses, especially old houses, were quite alive; I all but spoke to them. There was no imagination in it. I did not think of anything, I simply walked along while trying to remember myself and looked about; the sensations came by themselves." I guess the suggestion is that we should try to wake up - properly - and become more aware. Lots of what we do is carried out without proper thought, almost with robot like routine. I realised this again the other day when I had been out somewhere in my car and then for a moment wasn't too sure where I was on my journey. I had no awareness of having driven a certain distance. We tend to do so much on automatic while the real us is hidden below the surface. If you want to avoid death by hanging the secret can be found at St Ludgvan's Holy Well, Cornwall. It is said that no child baptised in its cool and crystal waters ever needed to fear the hangman's noose. 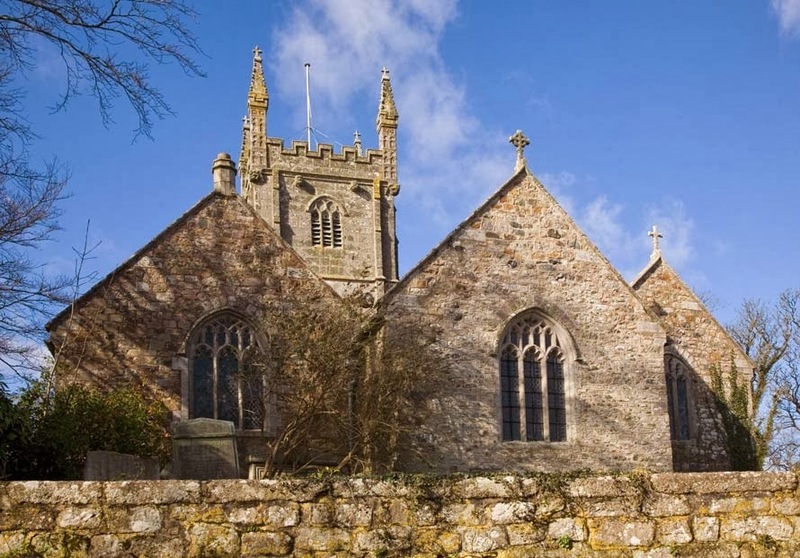 That's the thing about Cornwall, where I live, it was once populated by so many Saints - and many are hardly known. Take St Ludvgan for example. St Ludvgan prayed for water and his pleas were, of course, answered by the appearance of a crystal clear stream. But there was more to the waters than their coolness. The Saint washed his eyes in the sparkling stream and was amazed to find that this enabled him to see microscopic objects. Being quite chuffed about this he prayed some more and found that he now possessed a great fluency to his speech. For some reason he prayed yet again and bizzarely requested that all children baptised in the stream should be spared the hangman's cord. The water had great powers which St Ludvgan had to put to the test. During one baptism, the young child in his arms called upon the name of Satan and the Saint was obliged to perform an immediate exorcism. The Devil appeared before the congregation and they watched as he grew to a gigantic size before spitting into the water thus ruining its power to give the microscopic sight and the gift of great oratory. The Devil however didn't remember to wipe out the waters power to save those children baptised from being hanged. St Ludvgan swung into action and despatched Satan to the Red Sea in a great flash of lightening, which also brought down one of the pinnacles of the church. Today most of the powers of the well waters have been dissipated other than the promise of keeping baptised children free from the hangman's noose. And that's St Ludvgan, sometimes known also as Ludowanus or Ludewon. The church at Ludvgan is now known as St Paul's church but was originally dedicated to both St Ludgvan and St Paul. Two straightforward coincidence examples today from Amanda. 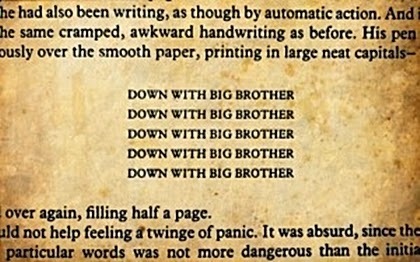 The first is perhaps more about telepathy than synchronicity, but maybe it's the two combined. The first coincidence began one day at work, at about 2 pm. I began to feel that I needed to leave right then. I wasn’t sure why as I wasn't due to leave work until 4:30, but I had a nagging feeling that it was time for me to leave. I asked my boss for leave and she granted it, so I began my drive home. Imagine my surprise when I saw my fiancé walking home from his place of employment. He too shouldn’t have been off work until 4:30! He had been to a meeting and was unexpectedly let out early and was just walking home. We happily spent the rest of the day together. The second coincidence happened at an internship of mine. I’m at a Senior Citizen's Center and we were cleaning up around the building one day when we happened upon an album of old postcards and greeting cards. The cards were dated between 1911 and 1918 and imagine our surprise when the very first card we opened was from that day's date (February 12) - not 2013, but 1913!" Back in 1969 Pamela Johnson, when she was just 17 years old, felt she had to put her three month old baby up for adoption. She explained her reasoning at the time, "In the sixties, if you were an unmarried mother, you didn't really bring a child up on your own. I felt I was really young to be a mum, and I didn't know that I could provide for him properly." In the 1960s Pam was living in The Midlands (the middle part of England). The young baby was adopted by Penny Darling and her husband who, at the time, also lived in The Midlands. She remembers collecting her baby, Steve. "He was absolutely sobbing when we went to pick him up. We went outside and got him in the car and he stopped crying. He was the most amazing baby from then on." Much has happened over the years since the adoption. Steve now lives in Devon, on England's south-west coast and is a Torbay councillor. He also does research for the local Liberal democrat Member of Parliament, Adrian Sanders. Being a researcher he decided to try and trace his birth mother, Pamela. Much to his surprise he found that she was living at Kingsteignton - just six miles from where he lived. His birth mother, Pam, had taught at Coombe Pafford School, which is in his council ward. He also discovered he had a half-sister living in Upton Road, Torquay - a road he walks along every day to go to work. 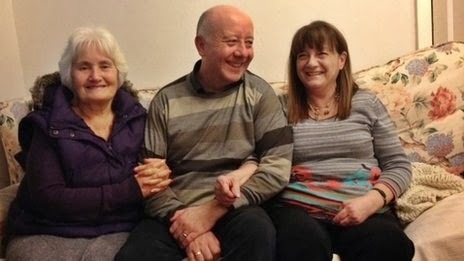 Mr Darling said of finding his birth mother, "It's really great - they are both my mums. One of them has cared for me throughout my life. The other is just an excellent person to have in my life now, so it's really good." We received the photo above on the front of a 'thank you' card from our grandchildren for their Christmas presents. 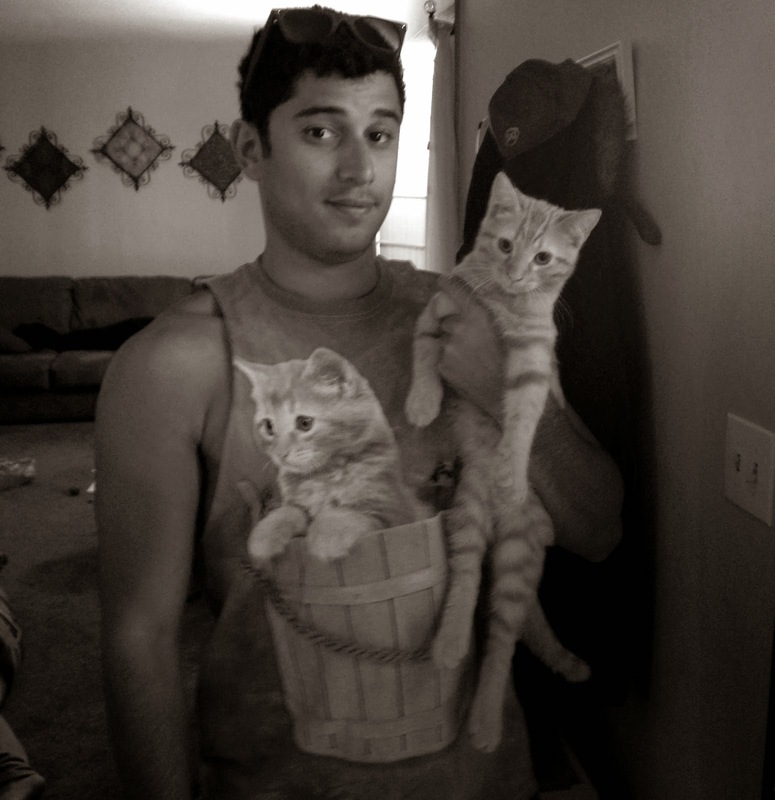 It's not really a coincidence, other than the two kittens do look alike, but it's a cute picture. I also came across a kitten story, dated August, that poses a question. "My two year old cat died from a virus in June. A couple of days ago, I found a stray kitten that was stuck under a dumpster and she was crying for help. She looked identical to my cat that had died. She is solid black with yellow eyes and has a patch of white fur on her stomach just like my last cat. She is about eight weeks old, so she was born about the same time that my cat died. They both have the same personality and quirks and loved to lay on their backs to get their stomach rubbed. Both are very friendly and loving. She looks like a mini version of my previous cat. Does you think that's a weird coincidence or something else....?" So do cats and animals reincarnate? 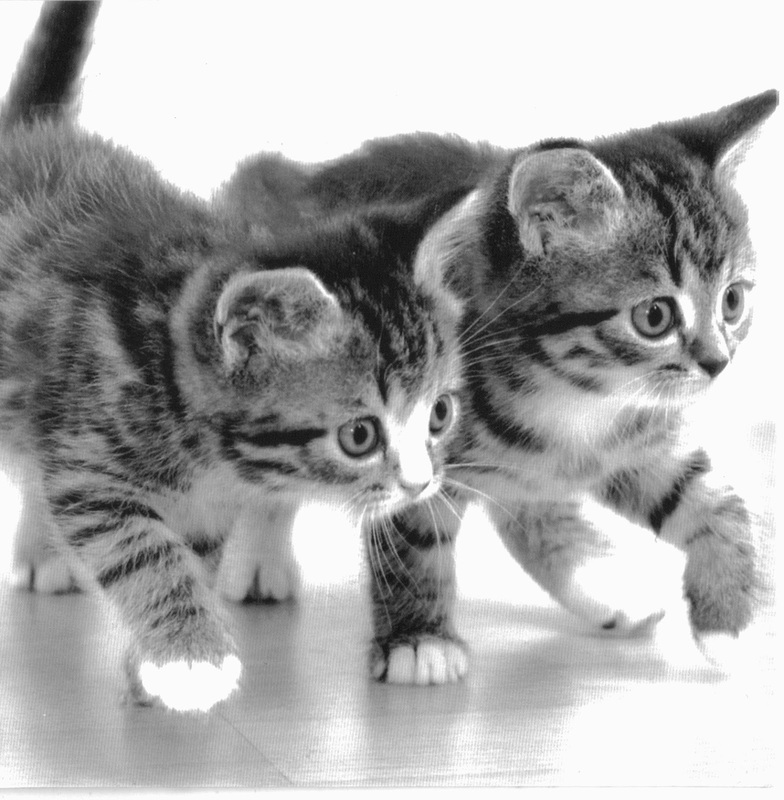 And finally another kitten photo I saw on the Ingur website. The photo is titled: "I went to my friend's place to meet his new kitten ... quite a coincidence"
I think that'll do for a Sunday - have a great day. I had a dream a few days ago about a car going into a river. When I saw some of the photos of the floods we have had in England I thought that must have been what the dream was all about. Today though, leaving my house, I snapped the photo above. A few minutes earlier the driver of the car swerved to avoid a car coming in the opposite direction. Goodness knows how or why, as the road is wide enough for two cars to pass each other. The driver lost control mowed down the flimsy metal barriers and nearly went splash into the river, which is below the road level. Fortunately there was a substantial tree to halt a watery finish. The driver was badly shaken but not hurt. "I live in the USA. A few years ago my youngest son ,who is a guitarist, met a couple of young guys from the UK in a blues club. They had come to US to experience southern blues music as they were both extremely talented musicians. My son brought them home with him and they wound up living with our family for the better part of six months. About two weeks before my son met them in this bar I had this crazy dream where the word "ENGLAND" flashed across my dreamscape several times. My actual dream I don't remember. A few days after that experience I dreamed I was sitting in a smallish cottage sitting room and had full knowledge, without anyone saying a word, that I was in an English cottage. The decor and everything about it was so distinctly English. Actually the boys who were our house guests for a few months were from Cornwall." Note: I live in Cornwall. I used to get runs of precognitive dreams but they have been few and far between over the previous few years. I've even dreamt the winners of horse races, though that was a long time ago. In 1983, for example, I dreamt the winner of the English Grand National. I told my wife the name of the horse - Corbiere - and also mentioned this to a friend prior to the race. The strange thing is, I don't know anything about horse racing and hadn't seen a list of the horses and riders. I have only ever been once to a race meeting, and that was with the friend I told about Corbiere. I didn't like the outcome as a horse fell, going over the jumps, was badly injured and had to be shot. That was the beginning and end of horse racing for me. But precognition in dreams? Why not, it dates back probably to the beginnings of mankind. I'm sure most of us have read books that have had an influence on our lives and perhaps even altered our thinking or beliefs. But researchers now claim to have shown that even reading a novel changes the way our brain works - perhaps even permanently. To quote from the study - which you can read in pdf format here. "On the days after the reading [of a novel], significant increases in connectivity were centred on hubs to the left angular / supramarginal gyri and right posterior temporal gyri. These hubs correspond to the regions previously associated with perspective taking and story comprehension, and the changes exhibited a time course that decayed rapidly after the completion of the novel. Long term changes in connectivity, which persisted for several days after the reading, were observed in bilateral somatosensory cortex, suggesting a potential mechanism for 'embodied semantics'." Must admit that bit was a little hard going for me but in simple language the scientists claim that favourite books create 'muscle memory', meaning we may actually start to mimic a character's actions or life choices. 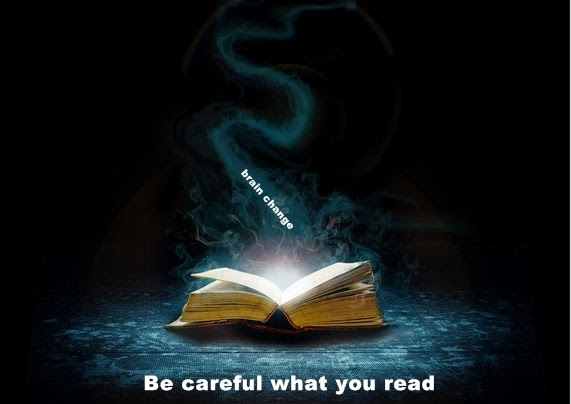 Does this mean we have to be careful as to what we read? 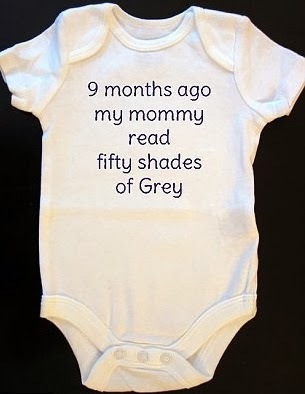 Has 50 Shades Of Grey unleashed ... well, goodness knows what? But everything influences us: movies, television, newspapers, propaganda, parents, teachers and so on. It makes you wonder how many of our thoughts and beliefs are actually our own. Maybe we are just made up of bits of flotsam we have encountered. From what I've read of the study I'm not sure how long these changes in brain function last. It's indicated that they last for at least five days but the researches seem to be saying that they could last longer than this, though no time span is specified. Ah well five days isn't so bad, unless the influences are reinforced over and over - which is what the manipulators try to do. The Daily Mail wrote about this subject with the headline: Read on to change your life. They then began by saying "Great novels really can change your life ..."
But that surely means that 'bad' novels and reading matter can change our lives too. What we read and see helps make us what we are. Looking at some of the stuff on the Internet that's a scary thought. 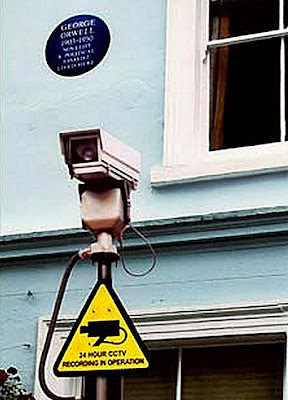 This was George Orwell's house at 22 Portobello Road, London. The house (and the sign bearing his name) is genuine but the question is: Has the photo been photoshopped and the camera added? Could well be, but the photo gets a message across! I then found the same photo on the Imgur website and when I saw the number of views it had - 976 - I saw it as an indicator that I should publish the photo. I have written several times about how 976 is an important number in my life. See, for example my posts, The 976 Coincidence or The Missed Post Coincidence And Other Wanderings. Quote from 1984: "His pen had slid voluptuously over the smooth paper, printing in large neat capitals - DOWN WITH BIG BROTHER DOWN WITH BIG BROTHER DOWN WITH BIG BROTHER DOWN WITH BIG BROTHER DOWN WITH BIG BROTHER over and over again, filling half a page." Quote: "In North Korea, every person is property and is owned by a small and mad family with hereditary power. Every minute of every day, as far as regimentation can assure the fact, is spent in absolute subjection and serfdom. The private life has been entirely abolished. One tries to avoid cliché, and I did my best on a visit to this terrifying country in the year 2000, but George Orwell's 1984 was published at about the time that Kim Il-sung set up his system, and it really is as if he got hold of an early copy of the novel and used it as a blueprint." Strange where you end up after looking at a photo. Quote from 1984: "The two aims of the Party are to conquer the whole surface of the earth and to extinguish once and for all the possibility of independent thought." Those ghostly visions, which some bereaved people experience shortly after their loss, are simply hallucinations. Well that's what scientists would have us believe. I came across a study on this subject headed by Agneta Grimby of the University of Goteborg, Sweden. One of the things that struck me was how common these 'hallucinations' actually are. 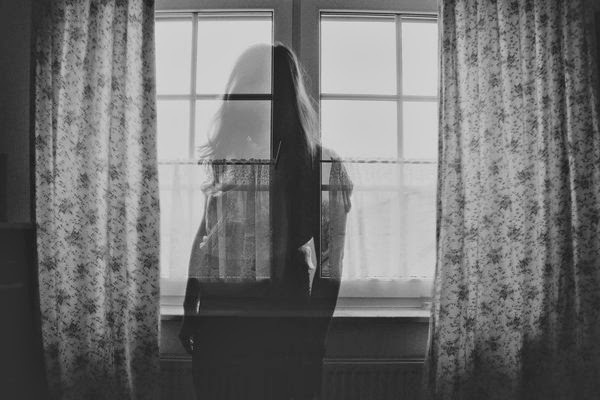 "We often fall back on the cultural catch all of the 'ghost' while the reality is, in many ways, more profound. Our perception is so tuned to their presence that when they are not there to fill that gap, we unconsciously try to mold the world into what we have lived with for so long and so badly long for. Even reality is no match for our love." From Angeladtao: "I was talking to a man who had lost his son in Iraq today. His wife had seen the son after death as a warm, concrete presence who reassured her that he was happy and well. They are both atheists, so there was no complicating factors about religious beliefs here. I have heard other similar experiences." "My view is that our bodies, if you go down to the molecular levels, are made of atoms which, in turn, are made of energy. Therefore, we are essentially beings of energy. Mass is a relative term when you look at it that way. Our skin is made of atoms (thus, energy) which, for some reason unknown to me, manages to contain our atoms within it in a human shape. Our thoughts are energy generated from atoms in the neural pathways. Why is it that when our life ceases, this unknown force that contains our atoms in its human shape fails to continue to do so? That is a question for another day. Yet, the energy that composes us is never lost, and its mass is still present in our universe (E=MC2). I think that there is another force/power/influence that allows us to maintain our human shape when alive that withdraws at death. However, the energy pattern of our consciousness is still present. My explanation (and it is, of course, only a suggestion) is that our 'personalities' or 'souls' are still very close to the state of being that it was just a part of and can pull together enough atoms to re-make a temporary body for just a fleeting moment when they sense the strength of grief of a loved one (more energy). What happens after that, I leave to others." "During the Second World War my granny woke my father in the middle of the night convinced that another of her sons, Stanley, had just been fatally wounded and was calling to her for water. My father was able to reassure her that her son, and his brother was thousands of miles from the war front convalescing in hospital after an earlier, non-life-threatening wound. However, granny, usually a very strong character, was inconsolable and convinced she had received a communication from her dying son. In actual fact my Uncle Stanley died that very night of a wound received at the Battle of Knightsbridge. Unbeknown to his family he had recovered from his previous injury and returned to his unit, and died that night in a German field hospital of blood loss - and hence in great thirst." It's up to us as to what we believe or want to believe. I personally believe we live on after death. 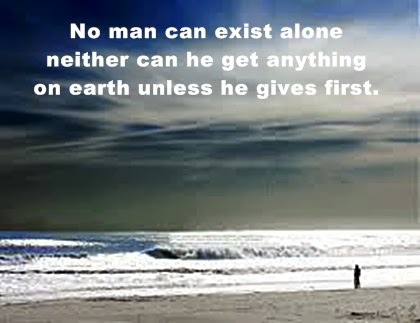 One of the great spiritual laws, I've often seen, is along the lines of: No man can exist alone neither can he get anything on earth unless he gives first. Nothing new in that but I was reminded from something I read that this also applies to countries, continents or any groups as well as to individuals. "As the Great War of 1914-18 drew to a close the horror of the battle fields was replaced by the greater mortality rate of the great influenza plague which spread across Europe, gathered momentum, carrying itself across the Atlantic to USA and eventually spread as far as Australia. It was a particularly deadly virus which killed with the ferocity of shell fire, decimated whole families and, adding to the sorrows and disasters of the War, left Europe and much of the world prostrate. The suffering, starvation and destruction of sanitary installations apart, there is every reason for concluding that the Influenza Death of 1918-19 was a direct result of four years of concentrated hatred of such a depth and intensity that it actually brought about biological changes resulting in the creation of a new virus. Millions died in hatred. Millions more succumbed to the result of hatred." The assumption from this is that hatred possesses certain powers. But why then wasn't there a similar virus following World War II? It's about the degree of hatred. "Strangely enough the Second World War, even greater in its ramifications and extending over a far greater area of the earth was not accompanied by such concentrated hatred. The First War was fought in a spirit of unmitigated power lust, it was blatantly and unashamedly a military war fought for victory and for the sake of victory. It was accompanied by no great hopes for a better world after victory. Its aims on all sides were directed to the accumulation of more territory and the sheer killing of as many millions as modern industry could handle. It ended on spite and an atmosphere of punitive vengeance. It was woe to the vanquished and to the Devil with compassion. The bleeding sword of retribution was the final and only arbiter. Out of this appalling state of mind arose the Great Deaths as factually contrived as though it had been planned. Unfortunately, or perhaps fortunately, the victorious powers were smitten as much as the defeated. The Second World War ended upon a different note. It had always been fought more in sorrow than in savagery despite the appalling slaughter of far more civilians than in the First War. Nonetheless, the victors emerged from the Second War as awed and overwhelmingly conscious of evil as the defeated were. There was little though of revenge. The lesson of the First War had been learned and the vessel of peace was launched upon a sea of generosity never before witnessed in the history of mankind. Medicines, food and clothing were poured into Europe and the Far East in a grand effort to re-establish health and good will. We had all sinned in not avoiding the Second War and out of this awareness of sinning came the warm hand of reconciliation. No plague of the 1918 dimension followed. The wisdom of love, be it conditioned by self interest or not had prevailed and the world set out upon a venture of prosperity and humaneness never before envisioned." You may not necessarily agree with the doctor's interpretation of the two world wars. But it does illustrate that, as well being responsible for what happens to us as individuals, we also reap what has been sown by those supposedly acting on our behalf. Think Bush and Blair for example. What we give out - whether good, bad or the many gradients between these extremes - we get back.